Last week, Microsoft unveiled a revised and improved version of Skype Web. The online discussion program was enhanced with many new features that can be found on the desktop software. But the Redmond firm hid behind the fact that Skype Web didn't work on all browsers. 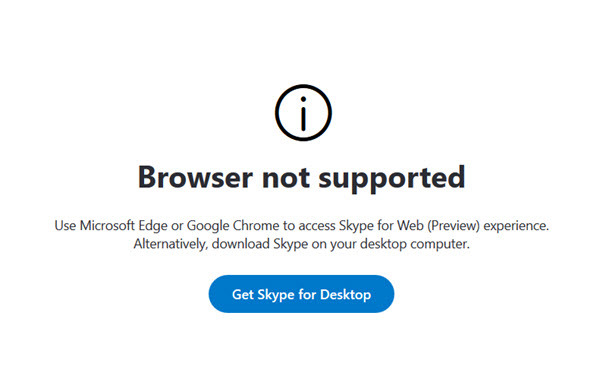 The new version of Skype Web only works on Microsoft's in-house browser and Google Chrome (and versions derived from Chromium such as Vivaldi). The ones left out are Mozilla Firefox, Opera or Safari. When asked by the VentureBeat site, Microsoft replied that Skype Web requires "real-time call and media technology" that is integrated differently depending on the web browser. The Redmond firm preferred to focus on Google Chrome, probably because it is the most used browser, and on its in-house browser. Microsoft has not given any more details about this famous technology that prevents Skype Web from running on Firefox, Safari and Opera, but it is certainly WebRTC, an open source technology that allows browsers to communicate in real time. The decision to abandon some browsers is a surprise: Skype has lost ground to competing solutions like WhatsApp, Facebook Messenger or Viber and leaving a handful of browsers behind will certainly not improve the situation. You can always console yourself by thinking about the many new features added to Skype Web but you will have to go through Microsoft Egde or a derivative of Google Chrome to be able to use them.